VAMPIRES AND LIGHT out now! It's official. My newest book is in the world! 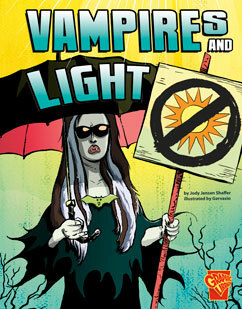 VAMPIRES AND LIGHT (Capstone Press) hit virtual bookshelves a couple days ago. Official release date is January 28 for hardback and February 1 for paperback. "Learning about light doesn’t have to be scary. Join vampires as they uncover the science of light and the electromagnetic spectrum. You’ll give your knowledge of light a boost with a monster dose of humor." Written for third and fourth graders (with an interest level up to ninth grade), this comic book-style book explains what light is (energy), how light works (through waves), the characteristics of light, and how light makes life on Earth possible. Don't be afraid. Take a peek at VAMPIRES AND LIGHT. Just be sure to keep your flashlight handy! Today we've been joined by children's picture book author Diana Murray. Thanks for stopping by, Diana! How did you begin writing for children? When I was eight years old, I wrote and illustrated my first book. Instead of trying to get it published, I buried it under a tree. I imagined that archeologists might find it someday and put it on display in some shiny, futuristic museum. In college, I majored in psychology and (unofficially) minored in art. After that, I worked in the field of graphic design. When I left my job to stay home with my first daughter, I started reading her picture books. Lots and lots of picture books. I had never really been exposed to that genre before. I had never had that magical "picture book experience" as a kid. It felt wonderful to share those moments of bonding with my daughter. I began to fall in love with picture books and buy them by the dozens. I had picture books squeezed onto every shelf in my apartment (not to mention the chairs and tables). How did I not know about them before? They were the perfect blend of everything I adored--art, creativity, philosophy, psychology, humor, wordplay, quiet, conciseness--all in an attention-span-friendly, easy-to-share package. 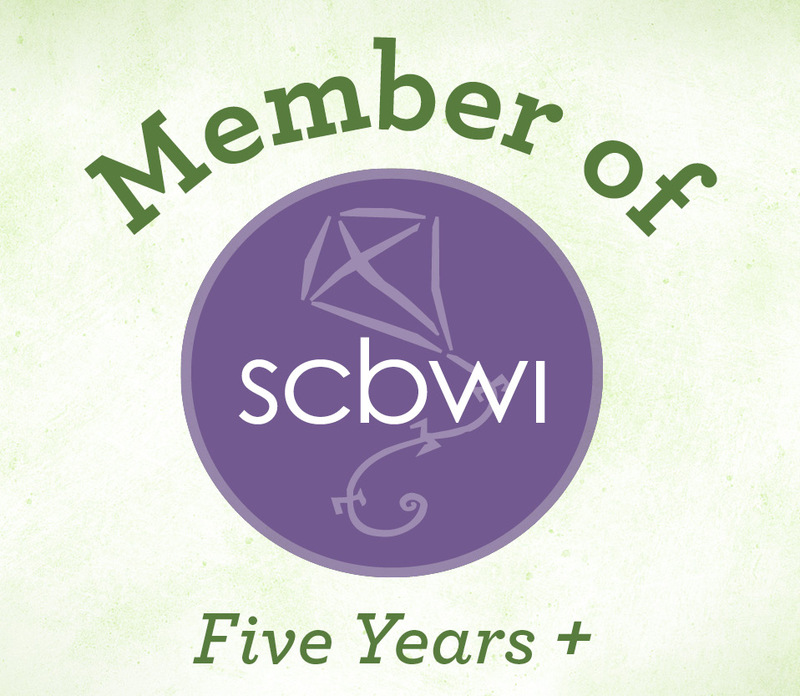 After some fumbling around, I finally joined SCBWI around 2007. I started exchanging manuscripts with other writers, making some contacts, and learning the basics. You've been published in lots of great children's magazines. Tell us about your magazine work. When I started writing, I focused on picture books exclusively. But in 2008 I joined a great critique group and soon began to write more and more short poems. I got better at interpreting criticism and applying it to my own revisions, as well as offering constructive criticism to others. Slowly but surely, my form rejections turned into personal rejections with invites to submit again, and finally, acceptances. My first acceptance to a major children’s magazine came from Spider in 2010. Since then, I’ve sold twelve poems to Highlights for Children, Highlights High Five, and Highlights Hello, as well as one poem to Clubhouse Jr. It’s worth noting that some magazines take many months to respond to submissions, so the process can take awhile. “Unwelcome to Opposite Island” was the first poem I ever got to see in print. It was published in the July 2012 issue of Highlights. It was wonderful to see how the illustrator could bring it to life. Your story, GRIMELDA, THE VERY MESSY WITCH, won the 2010 Society of Children's Writers and Illustrators' Barbara Karlin Grant, awarded to an aspiring picture book author. Tell us about the story and your win. The manuscript grew out of a concept I had for a quirky, messy character. The plot for the story kicked around in my mind for a few weeks, and once I started writing, it just poured out. Sometimes I forget this, but I was about seven months pregnant at the time! Anyway, I could tell from the reaction of my crit group that I might be onto something. I polished it up a bit and sent it off with my grant application. I got the call in early July. I didn’t pick up, as I assumed a telemarketer had been calling me all day. When I listened to the message, I nearly fell over in shock. It was just the confidence boost I needed. I felt like things were finally starting to come together. That was the first time I openly shared my secret passion with my family (not including my husband, of course, who had been supportive all along). There’s a bit more about my experience winning the grant here: http://taralazar.com/2010/07/06/piboidmo-success-story/. More recently, you landed an agent and sold your first THREE picture books! Can you give us some details? When I read about my agent, who was new, I had a strong feeling that she might be “the one”. I queried her with GRIMELDA. In a couple of weeks, she wrote me back that she really liked it, was sharing it around, and that she wanted to see what I else I had. I selected five more manuscripts to send to her. After a great phone conversation, we decided to work together, with an initial focus on selling two picture books: GRIMELDA, THE VERY MESSY WITCH, and NED THE KNITTING PIRATE: A SALTY YARN. There’s more about my experience getting an agent here: http://frolickingthroughcyberspace.blogspot.com/2012/09/how-diana-murray-got-her-agent-plus.html. At this time, I can’t give too many specifics about what went down, exactly. But to sum things up, NED and GRIMELDA both sold pretty quickly. GRIMELDA sold in a two-book deal, so that will be my first experience writing a manuscript under contract. It’s extremely exciting! What advice do you have for those who write poetry or picture books for children? Read everything you can get your hands on in your genre, never stop learning, write what excites you, crit and be critted (both equally important), revise wisely, don’t get stuck on one manuscript, take chances, and have fun! There’s some more advice here: http://laurasassitales.wordpress.com/2012/06/11/write-like-a-top-chef-with-diana-murray/. Thanks for sharing a bit about your writing, Diana. Good luck! Thanks so much for having me, Jody, and congratulations on your new and upcoming releases! Diana Murray is a picture book author and poet represented by Brianne Johnson at Writers House. She lives in the Bronx with her husband, two very messy children, and a goldfish named Pickle. http://www.dianamurray.com.